I used to be a lot more introverted, especially throughout college. In the last couple years, I've become a little more extroverted, honestly. I think having a kid might have something to do with that. Weird how that kind of stuff can change. But I think I will always feel like a complete introvert, no matter what some Meyer's Brigs personality test says. I always wondered how introverted moms handle having children, especially 3, 4, or more. Even one child takes a lot of energy mentally and physically. There's things I do that, I guess, keep me centered when I feel like I am running on empty. 1. You stay up 4 hours after everyone has gone to bed just because you need the silent alone time. Or if you're a morning person, waking up an hour before everyone else is heaven on earth. 2. You are terrible at responding to texts, calls, and emails. Partly because you're busy and partly because even responding feels like too much energy at times. 3. You're awkward with other moms at the park. But I force myself to make conversation with them so Mira can grow up seeing it's normal to interact with people. And really, it's not so bad. I can fake being an extrovert pretty easily. 4. You listen to your own music in the car. My music gives me energy and puts me in my happy place. And on the plus side, Mira will grow up to be musically cultured. Only because you have your phone with you. I can't do this when I'm home alone with Mira, though. I get a knock at the door within seconds. Does she eventually figure out that bathroom time is private time or no? A 10 minute trip to Target might end up lasting an hour. You just putz around (mostly the home decor section) and enjoy the silence. Not a time to clean, work, or get other things done (although I do that a lot). But ideally I like to take this time to do something completely for myself, like watch netflix or read a book. I'm finally collecting my thoughts and I don't want to waste the chance to have "me" time. Introverts give energy to people, while extroverts take energy from people. Being an introverted mom means you are giving energy to your children. They are lucky to have you! 9. Your idea of a perfect day with your child is going to the park in the middle of the day on a Monday when it's empty. I meannnn if there's like one other mom there it's okay, but when there's a bunch of people there it feels kinda lame to me. After it all, Mira appears to be extroverted (like her dad). And when the park is full of people, she is ecstatic. It truly helps me see the other side. I see how much she loves interacting with people and the burst of energy she gets when a group of kids arrive to the playground. I feel like it makes my grinch little heart grow a size bigger and maybe, just maybe, I get some secondhand extroversion and enjoy the moment as much as she is. Thank you, sweet child of mine, for helping me become more versatile so I can enjoy these moments with you. I am an introvert, too. I remember when my daughter was around 2, I forced myself to sign her up for a play group. I had no idea that parents separated from the kids and went to a parenting class simultaneously, and it kind of became the one thing every week I got out of the house for. So that was nice. Now that she's 9, my son is 7, and I have a 4 week old daughter, I'm kind of terrified to do it again. 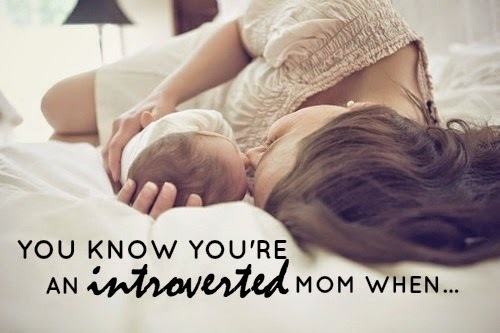 I'm not a mom, but I am an introvert, and this will DEFINITELY be me. Shoot, as a puppy mommy, I spend extra time in the bathroom. I relate to every single one. The staying up by myself, my music, the Target time. I choose one park specifically because there's never anyone else there. As my kids get older, I'm really worried about social situations. This is exactly who I am. So glad to see someone understands this. This is so me! It can be so tough but i try to come out of my shell a little bit. I am very much an introvert. I have two beautiful daughters that have made me want to be an extrovert. It can be tough but it has been worth every moment! Ironically I worked in the medical field where I interact with people all day! I don't think these things describe an introvert so much as just how you feel as a mom. I am an extrovert and very much enjoy "me" time as well as many other of these things listed.